Faber Piano Adventures. Instructional methods. Collection (softcover). 32 pages. Faber Piano Adventures #FF1083. Published by Faber Piano Adventures (HL.420176). The 2nd Edition Level 2A Performance Book offers an array of colorful elementary pieces that reinforce the concepts presented in the Lesson Book. The selections range from arrangements of classical compositions to American folk songs and imaginative originals. Students and teachers will enjoy the wide variety of sounds and musical textures in this collection. My students love Piano Adventures and so do I. The lessons are progresdive yet move steady into new concepts for the high achievers. 25 years of teaching piano and I have to say that Randy & Nancy Faber are by far the mist thorough and creative with performance pieces too! grasping the concept of two-eighth notes as additional practice pieces. I have had success with all my students by using this book! Students also love the pieces, especially "The Loch Ness Monster, Coconut Shuffle," and "The Horseman's Night Ride." 105 of 217 people found this review helpful. 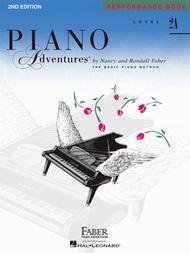 Piano Adventures is a very detailed piano book for the early intermediate student. Easily understandable directions for your student. Highly recommend. 112 of 219 people found this review helpful.